Children attend a class at a primary school in Muna Garage IDP camp in Nigeria. 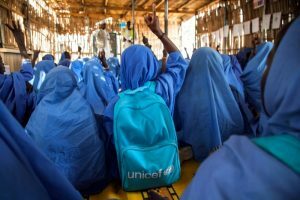 Back in September for example, UNICEF built eight temporary classrooms in an IDP camp in Maiduguri, the capital of Borno State. Thousands of children live in the camp and many hadn’t been to school in years, since they were forced to leave their homes due to the conflict. On top of that, the majority of schools in the state were closed because of the fighting and not all of them have reopened. The response to the school in the camp has been amazing. If you come to the camp in the morning you will see children drop what they are doing and run to the school gates when it is time for school to start. In just 6 weeks, we had more than 1500 children enroll here. Now I think they like coming to school more than I do! You know some of these children have been held by Boko Haram for several months. They are traumatised. Some of them even saw their parents being killed. So, alongside basic maths and English lessons, we engage them in psycho-social and recreational activities, as a way to help them deal with the trauma. There’s also a safe space for the children to play. We put in swings and slides and there are skipping ropes and footballs — using play and games to also help children recover. You can see them recovering in front of you. And when I see that, it makes me so happy to have made that kind of impact on someone’s life.